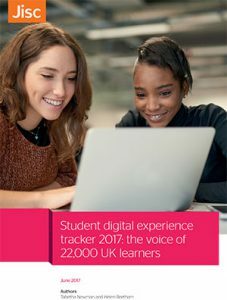 Today we’re launching the confirmation form for the Digital Student Experience Tracker 2017-18. You’ll automatically receive this form if you completed the first sign-up form. If you complete that first form now you’ll get the confirmation form within days – so if you haven’t committed yet, now is a good time to take the plunge. ‘Confirmation form’ may not set your pulse racing, but we are feeling pretty excited about it. Here’s why. First, we already have over 100 institutions signed up. There has been so much interest that we are considering extending the sign-up window to the end of October. 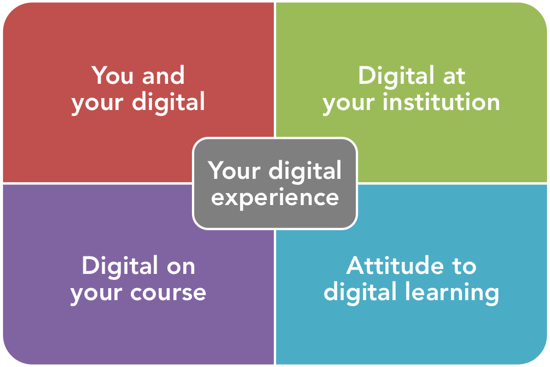 We have been asked to present this data at a number of national and international forums, and to support the Welsh Government in exploring the digital experience of college students across Wales. So we expect this year’s tracker to provide a bigger and richer picture of the student digital experience than ever before. Second, with so much valuable data from learners, we’ve decided to collect some organisational data to put alongside it. That way we can see what universities and colleges are doing that relates to the student digital experience. We can create powerful messages about what makes a difference. And you as participants can compare your approach with those of your peers. So as well as asking which tracker surveys you want, and clarifying data responsibilities, the second sign-up form asks ten new questions about issues in your organisation. You only have to answer four, but we hope you’ll like them enough to go further. You can get your results by email, so you can compare them with your student responses later, and start using them to have conversations with your colleagues straight away. We haven’t pulled these questions out of the air. We’ve spent the summer doing a literature search, reviewing other international surveys, and consulting with a panel of tracker users about the issues they think are important (thank you to everyone who took part). We also wanted to know what issues can be assessed by our lead contacts without them having to leave their desks. Many of the existing surveys are long and detailed. Producing something compact but meaningful has been a challenge. Finally, as we were developing the latest version of the tracker questions (blog post follows), we grouped the questions into four new categories. We have followed these categories through into the data we collect from organisations, and we will also be using them to shape the new staff tracker we are designing for this year. So we are offering three ways you can collect data – from staff, from students, and at an organisational level – that build into a rich picture of how the digital environment supports learning and teaching. Which best describes the state of your digital learning/technology-enhanced learning (TEL) strategy? How many full-time equivalent TEL support staff does your organisation employ (including centrally located and in departments)? Which best describes the state of your ‘bring your own device’ (BYOD) policy? Which best characterises your organisation’s approach to adopting new technologies for learning and teaching? How do you usually engage your students in improving the digital environment for learning? 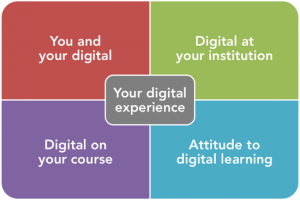 How do you usually prepare students for using digital technologies on their course? 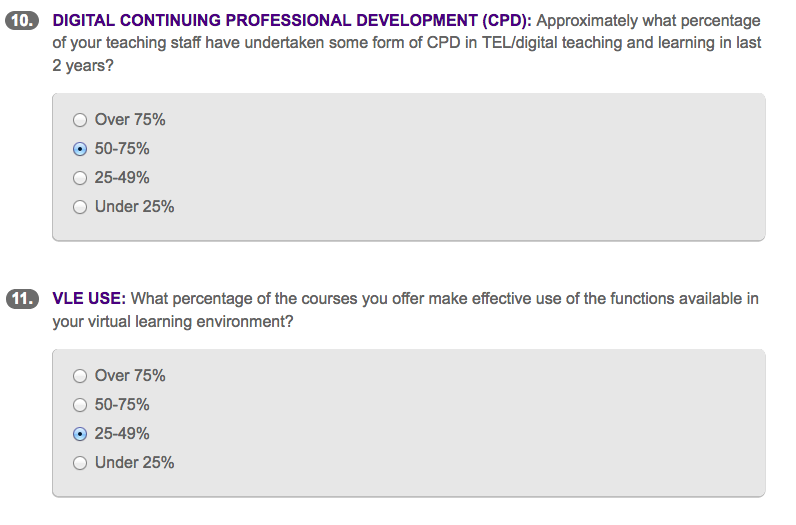 What percentage of your learning and teaching staff have undertaken TEL-related CPD over the past 2 years? 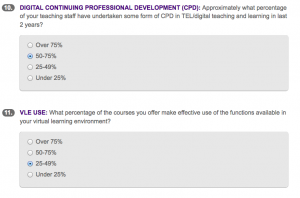 What percentage of the courses you offer make effective use of the functions available in the Virtual Learning Environment (VLE)? 10. What percentage of learning spaces have been designed or adapted to support effective digital learning? This year, also for the first time, we are bringing together panels of experts from the different sectors to review the evidence coming out of the tracker. This will include data from the sign-up process. If you have an interest in the questions we’re asking, and if you want your students to be part of this big conversation, please join us in the Tracker programme. Also you could consider joining our expert review panels later in the year. You can also contact Tracker Support for more details of the sign-up process, or Helen Beetham if you’d like more information about the background research that informed these questions.